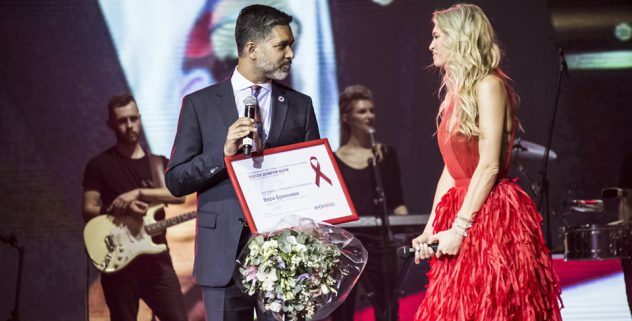 UNAIDS has announced the extension of the appointment of singer, actress and television presenter Vera Brezhneva as UNAIDS Goodwill Ambassador for Eastern Europe and Central Asia. “I plan to continue using my popularity in Eastern Europe and Central Asia in order to change the attitude in society towards HIV and people affected by the epidemic. And I sincerely hope that the global goal, to end the aids epidemic by 2030, will become a reality in our region,” – said Vera Brezhneva. Since her appointment in November 2014, Ms Brezhneva has been drawing attention to the HIV epidemic in the region. During her visits to countries, she has spoken to health workers, people living with HIV and women, children and young people affected by HIV. Ms Brezhneva has also served as a spokesperson for public information campaigns and has promoted HIV prevention messages on social media. “Thanks to Vera Brezhneva, thousands of people got tested for HIV. Thanks to her support, many people affected by the epidemic found the strength to fight and to believe in life,” – noted Vinay Saldanha, UNAIDS regional director for Eastern Europe and Central Asia. The HIV epidemic continues to grow in Eastern Europe and Central Asia, where an estimated 1.5 million people were living with HIV in 2015.